Why is my dream client so important? You know the saying about not being able to please everyone? It's true. What's also true is that different people buy for different reasons. You may have invested in that biz course because you really wanted to learn more about the topic - while your biz BFF may join because she's looking for a community to talk shop with. Both are great reasons to buy, but different pain points - and the two of you will respond differently to website copy, social media, sales pages, and more. Knowing your dream client allows you to speak directly to the person you're going to connect with the most. Are you sure she's not a unicorn? Yup. 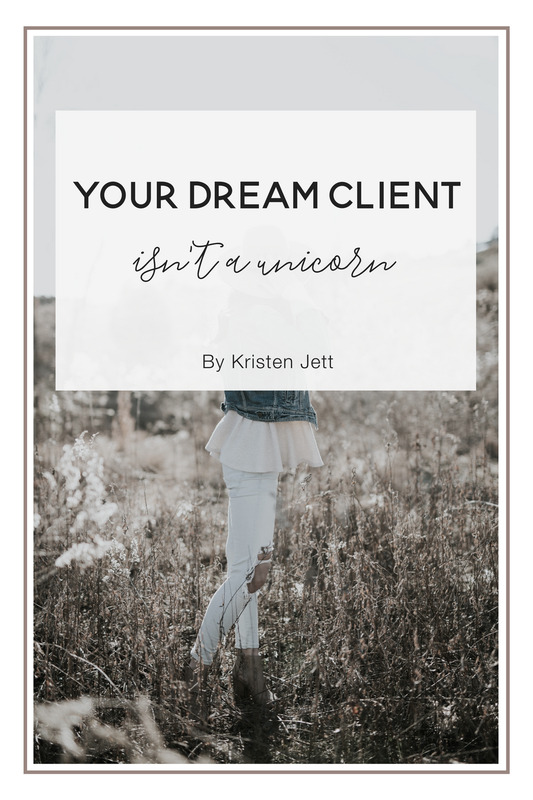 Here's the difference between finding unicorns and dream clients - see what you think! 2. Seat her under a tree in a picturesque grove. I don't know about you, but I certainly don't have time for that. So instead of hunting unicorns, let's attract our dream clients. It's not as hard as it sounds. To attract your dream clients, all you have to do is provide answers to her questions. 1. Define your dream clients. You have to know who she is before you can help her out. Sorry - you can't just make this up. Why? Because unless you are your own dream client, you're going to miss the mark. What you can do is think about the niche you fill, and who that solves a problem for. 2. Provide exclusive content that answers her burning questions. Every buyer has burning questions - no matter WHAT your field is. It can be whether she should eat after 9 pm, how to grow her business with Instagram, or how she can make her office chic with just her printer. See the difference in approaches? I know which one I'm going with! You can answer her questions in a lot of different ways - but there's one that stands out in particular: opt-ins. You create something special, stuff it full of information, and present it with metaphoric glitter to your dream client. In exchange for that info, your dream client gets on your mailing list (or opts in) - allowing you to keep connecting and bonding with you. So, you know you want to provide an opt-in...or more - how do you decide what to do? Remember - different types of dream clients are going to consume different types of opt-ins, and it's your job to not only match the content with something she's dying to know more about but to present it in an easy to use format for her. I personally get the most use out of ebooks - I can load them on my phone and read them on the go. A close second is email courses because I get just enough information at a time to keep me focused on one task - and that's it. A good friend of mine adores webinars and can't get enough of them. How much time does my dream client have? Is she always on the go? Being able to consume content in a hurry could be a necessity. Maybe she prefers webinar replays - that she can fast forward through, or audio interviews that she can listen to while at the gym. What type of learner is she? We all learn differently - consider how you can account for that. Maybe your dream client needs to be able to come back to something and look at it a few times - what format would be best for that? If you're really inspired, you can approach several different learning styles in one opt-in. For example, pair a webinar or a video with a workbook to complete during the show to keep both auditory and visual learners engaged. Bonus: This keeps the easily distracted (me!) from wandering off into other tabs and accidentally missing important goodies. What provides the most value for her? Value is key - value is what keeps your dream client coming back to you. Let's build a relationship - not a friendship that blows away in the sand. The more value you provide, the more your dream client keeps coming back to you for related topics. And why not? You gave her exactly what she needed once - she trusts that you're going to do it. Example: If you're a photographer selling to business ladies, you could write an ebook on how to take great photos. It'd do well - but if your dream client is on social media, you could narrow down even further and provide extra value. Instead, it could become a quick guide on how to take great photos for Instagram. Or even a set of freebie stock photos to use all over social media. Begin by considering what problems (pain points) your dream client has. What does she sigh over coffee about to her BFF? Place a shiny gold star next to the ideas that provide the most value - and then decide what format would benefit you and your dream client the best. If you can't get a video done for a month, pick something you can do now. You can always - and you should - have more than one opt-in. Stuck? Poll your audience and ask them what type of content works best for them. Bonus points if you also ask them what burning questions they have. Ready to create your opt-in? I can't wait to hear about it! Let me know your thoughts & ideas below! Kristen is a soul centered marketer + writer. Love is her thing - dream client love that is. Her special mojo is attracting dream clients to you + strategizing content to make you their number one #bizcrush. Do you wonder who your dream client is + why she needs you? Get Dream Client Clarity in three days with the free email course. You can find Kristen discussing attraction based marketing at Queen of Inbound, or tweeting about babies, bacon, and business at Twitter.